With as much pasta and lasagna as I cook in my kitchen, I don’t know why it took me so long to share my favorite marinara sauce recipe with you. In any case, it was worth the wait. Let me show you how simple it is to make this basic kitchen staple. This 1-pot, 9-ingredient recipe is forgiving. 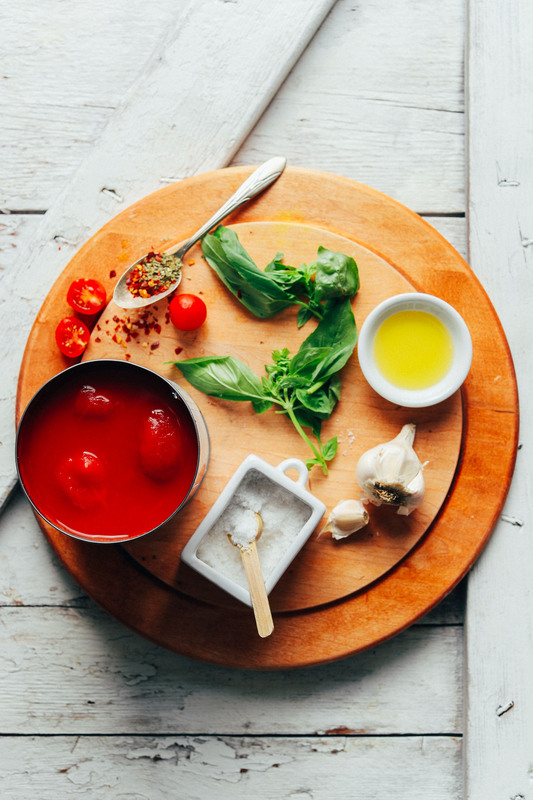 As long as you start with quality tomatoes and herbs, the rest kind of happens naturally. Plus, I include a couple of hero ingredients that save the day if things are tasting lackluster (a cook always need a good backup plan). I prefer using canned crushed, peeled tomatoes, but diced work as well. In fact, I keep a few cans in the kitchen at all times in case I need a quick penne and red sauce to save the day. Next comes flavor in the way of garlic, fresh basil, oregano, red pepper flake, and sea salt. Coconut sugar keeps things naturally sweetened and may seem like an unlikely addition. 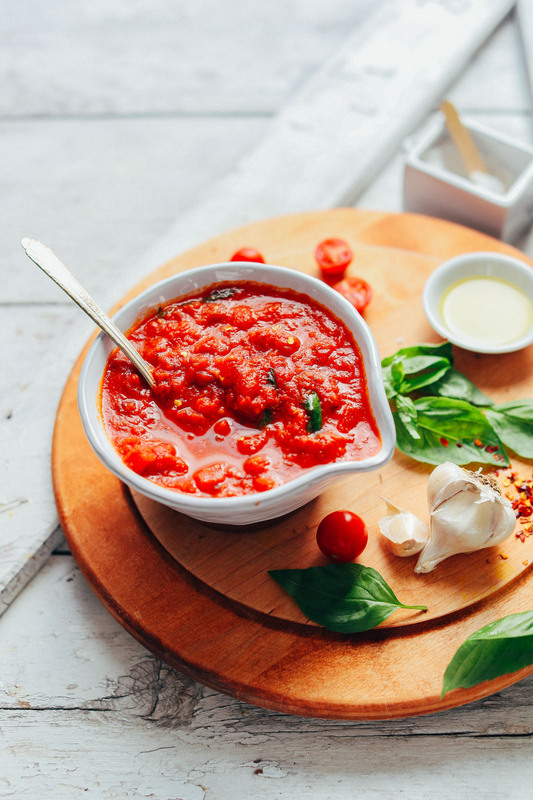 But sometimes tomatoes can be a bit astringent and bitter, and because this marinara is quite salty, the sweetness balances and enhances the flavors of the sauce. And what if, at the end, it just needs some extra oomph? Tomato paste and nutritional yeast to the rescue (for a little “umami” effect and more depth of flavor – trust me on this one). 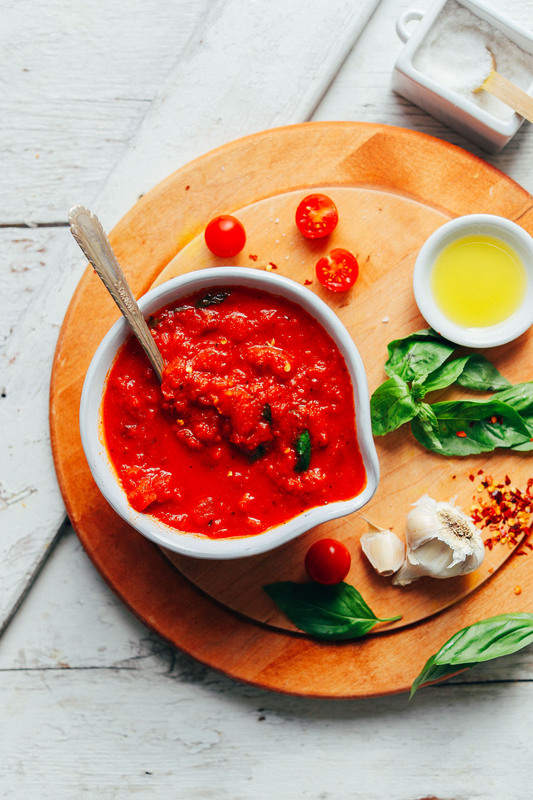 This is the perfect sauce for dishes like Spaghetti Squash Pasta, Eggplant Lasagna Roll Ups, Easy Vegan Pizza, Garlicky Pesto Breadsticks (for dipping), Vegan Meatballs, Chickpea Bolognese, Lentil Bolognese, and more. Add a dash of Vegan Pesto to the sauce for an even herbier flavor. Or a spoonful of my Vegan Tofu Ricotta or Whipped Almond Ricotta to take it to the creamier side! 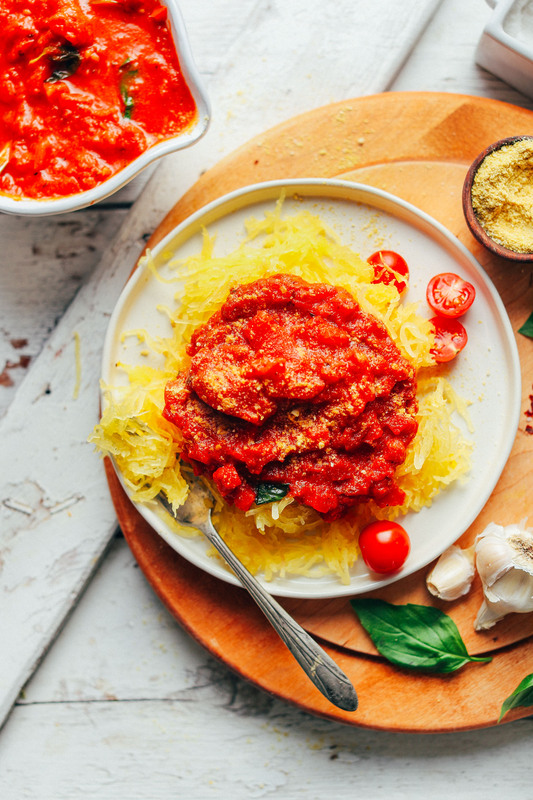 If you’re looking for cheesy things to pair with this sauce, be sure to check out my Vegan Parmesan Cheese (the perfect topper for any Italian-inspired dish) and Vegan Mozzarella “Cheese” (layered on top of your favorite pizza). 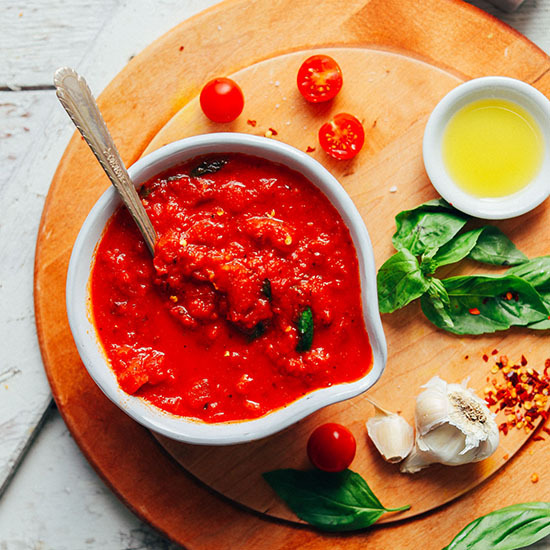 Easy, 1-pot marinara sauce that's rich in flavor, color and nutrients. Simply seasoned, cooked low and slow, and perfect for any Italian dish! Heat a large pot over medium-low heat. Once hot, add oil (or water) and garlic. Sauté briefly for 1 minute, stirring frequently, until barely golden brown. Then add tomatoes, oregano, coconut sugar, salt, and pepper flake. Bring to a simmer over medium heat. Then reduce heat to low and simmer uncovered for 30 minutes, stirring occasionally. Then add basil and stir. Cook for 5 minutes more. Taste and adjust flavor as needed, adding more salt for saltiness, oregano or basil for freshness/herbed flavor, pepper flake for heat, or coconut sugar for sweetness. At this time, you can also choose to add nutritional yeast and/or tomato paste for more depth of flavor and richness (optional, but I usually add both). If the sauce has thickened too much at this point, thin with a little water. Although I prefer mine thicker and leave it on the thick/chunky side. Serve with your favorite Italian dishes, such as Eggplant Roll-Ups, Eggplant Lasagna, Chickpea Bolognese, Spaghetti Squash Lasagna, or Veggie Meatballs. Or simply over a serving of cooked pasta of choice or spaghetti squash. Store cooled leftovers in the refrigerator up to 1 week, or in the freezer up to 1 month. *2 large garlic cloves are equal to ~3 small garlic cloves or ~2 Tbsp minced garlic. *Nutrition information is a rough estimate calculated with oil and without the optional ingredients. *Recipe makes ~3.5 cups of sauce. What an easy recipe! It tastes so fresh and takes so little time to make and store. Such a big hit in my kitchen! Thanks Dana for sharing such amazing recipes. Forgot to say that I omitted the coconut sugar. It was it my pantry although I like a more acidic marinara. Yes I really did make this and it was fantastic! I paired it with sweet chicken sausage and brown rice penne from TJs (Trader Joe’s). I used the max amount of tomato paste, nutritional yeast, and extra fresh basil. My 6 year old loved it and said it’s the best pasta she’s ever had! Literally ate it as fast as she could. This will be a staple in my kitchen over store bought marinara! Yay! Thanks for sharing, Chris! Oh and hey, thank you for all your recipes. Every time I want to make something western, your blog is my go-to. Sometimes with other non Indian blogs, there are ingredients that I cannot find in my country but the ingredients you mention are almost always easily available here. Thank you! I have made it twice and every time it feels like heaven in my mouth. I am never going back to store bought marinara sauce. Of course being an Indian who loves her food to be hot, I added lots of chilli flakes and some ground peppercorn. I love it! Forgot to rate in my above comment! Thank you so much for all your wonderful recipes! My husband and I have not eaten tomato sauce in some time. This was delicious! I did not add the tomato paste or nutritional yeast because the kiddos do not like. Also, I did not have coconut sugar so I used cane sugar I had on hand. Next time I think I will try a date. Still so yummy! I used oregano this time but I am slightly allergic, so would like to sub next time. Do you think just using Basil would still taste good. If so, how much? Are there any other seasonings that would work? thanks! I made this using fresh roma tomatoes from my garden and maple syrup instead of coconut sugar…it was so delicious! So good I can’t stop thinking about it. I’m going to make a huge batch this weekend and jar it. I love the way your recipes automatically adjust the ingredient amounts for the servings that I input. Brilliant! That sounds delicious, Linda! We are so glad that you enjoyed it! Rather than opening up a tube or can of tomato paste, I added a few glugs of spent red wine for added depth, and it worked out beautifully. Loved this sauce!! Put it over some homemade gnocchi and veggies and it hit the spot!! Subbed the oil for water and didn’t add any extra sugar. Absolutely delicious! For me, a perfect marinara sauce. What did I especially like? Nutritional yeast – and the sauteed garlic. And a good place for my fresh basil and oregano. Oh – and addition of sugar (I used date). Basically, the entire sauce! I added vegan meatballs, and poured over baked spaghetti squash, and used another night over baked chile rellenos (a fabulous old Sunset Gardens recipe). This turned out great! I started by sautéing an onion and some mushrooms, then added the garlic. I skipped the sugar and upped the quantity of herbs. A quick and easy homemade sauce and I had a large jar left over for the next dinner. My son, who doesn’t often love the healthy meals I make, really liked this sauce :) Thanks Dana for another winner!! So Good! Munching as I type. I added a bit more garlic ( to chase away the vampires). Amazing as always! Thank you! Something doesn’t add up. 3 1/2 cups yield converts to 28oz, and your recipe says to use two 28oz canned tomatoes. I’m assuming you meant one 28oz can, or maybe two 14.5oz cans. Anyway, I’m looking forward to trying it, but I figured I’d warn anyone reading this to either double the rest of the ingredients (and expect about a 7 cup yield) or use half the amount of tomatoes. Subbed dried basil for fresh and this is still a 5-star marinara recipe! Thanks! You became one of my fav cook. Thanks for all your vegan recipies. Will make this and rate. I made this today and it is so yummy. So much better than the stuff in a jar. I used 1/2 crushed tomatoes and 1/2 diced. We like it chunky. I also added a little more pepper flakes because we like spicy. I had everything on hand except basil so I subbed a heaping tablespoon of pesto. Lastly, I had a few Parmesan cheese rinds in the freezer so I added those and fished out what didn’t melt. This sauce will be perfect for tomorrow nights rigatoni. Thanks for the recipe! I LOVE Minimalist Baker! My daughter went vegan a year ago, and I have been using MB recipes to include in our evening meals and have NEVER been disappointed. I tried this recipe for the first time yesterday—I made it exactly as listed (adding more herbs to our taste), including adding the paste, but not the nutritional yeast. My husband is Italin-while it was too thick for his tastes (I will forgo the paste next time) he LOVED it. I will also skip the coconut sugar—we typically do not add sugar to non-dessert items, but I tried it this time. We all agreed the sugar was distracting. Thank you, Dana! You make my life easier and yummier! One quick tip, it you are using fresh vs. dried herbs as with the oregano you want the fresh to be 3 times the dried to get the same potency. Also fresh is best used at the end as the flavor can be mutted slightly when cooked to long. Dried is best added early as it takes about 20 minutes for the flavors be pulled out. Love your blog, use it for Vegan and non fat recipes a lot. This tip is awesome! Thanks! This was a pretty good quick sauce. We are 90 – 95% plant based and follow a mostly traditional Mediterranean diet. In other words, we primarily eat whole plant foods and we eat fish and shellfish several times per month. We don’t eat any land meat or drink any dairy, but we do eat goat and sheep milk cheese sparingly. Given this, I added 3 TBSP of Pecorino Romano to the sauce. Additionally, I used 6 larger cloves of garlic and to mellow the acidity of the finished sauce I added 1/2 cup of neutral flavored soy milk. I also used 3 heaping tablespoons of tomato paste to create a nice thick sauce. For extra depth of flavor I might saute a small, grated onion before proceeding with the rest of the steps next time. I will use the sauce this time to spoon over my almond ricotta stuffed pasta shells which have been a family favorite for many years. What’s the nutritional yeast for? Hi! I was just wondering why you have to cook it for 30 minutes. What would happen if you just brought it to a simmer for a couple minutes and then used it? Would that change the flavor? Using your marinara recipe tonight in homemade lasagna. It’s absolutely delicious, and I’m relatively certain our pickiest eater will actually eat it. Thank you! So kind – thanks Danielle! Marinara sauce never fails to elevate any dish! My mother used to make her own marinara sauce to use for pastas and soups. It was so delicious and it tasted a lot fresher than store-bought marinara! My carnivore boyfriend and I (vegetarian) made this to go with cheese ravioli and it was absolutely divine. Such depth of flavor! We are continually impressed by your ability to make every recipe 10x more delicious with the inclusion of surprise ingredients. Hi Dana, does this sauce from your recipe taste sour? The commercial ones mostly taste very nice. I wonder if it’s just sugar factor or can it be attributed to the variety of tomatoes used. How do I get on your e mail list? Audrey, this sauce shouldn’t taste sour. 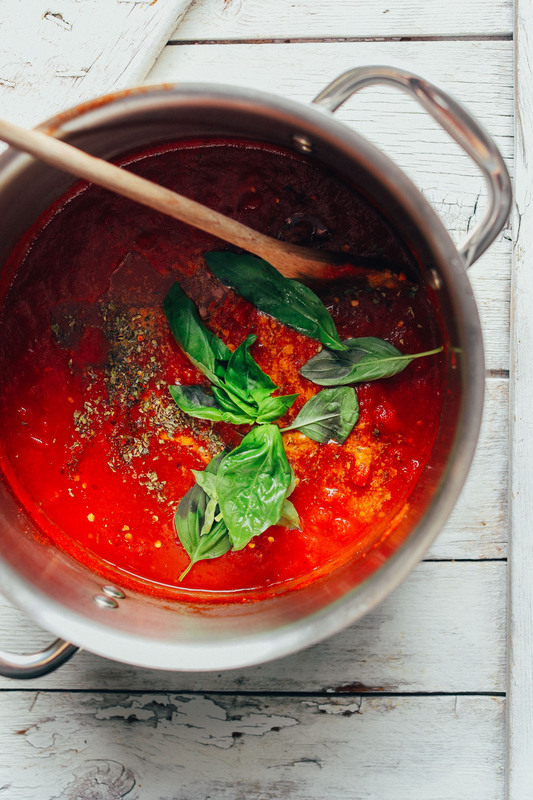 Most store-bought pasta sauces contain a lot of sugar, which helps balance the tomato’s acidity. To balance the acidity in this recipe, add more sweetener of choice. This has to be the best marinara sauce I’ve made. Thank you! I make this sauce, starting with one large or two medium onions, coarsely chopped, before adding the garlic to the pan. I use this sauce on pasta, in lasagna, for “meatless meatball” sandwiches – the meatless meatballs coming from Trader Joe’s. Some vegan mozzarella and sauce on a bun with the meatballs make a quick meal. Also, I like to get a package of vegan Italian sausage, cut the links into thin slices, heated up in the sauce and poured over whole wheat penne pasta for another quick meal. This sauce does not last long in my refrigerator because I use it up! I frequently make a similar sauce, also use it to toss with some grilled veg over polenta. For depth of flavour I tend to go with a dash of balsamic vinegar, also find when using that sugar seems unnecessary. Sounds great! Have you tried making it with fresh tomatoes? I’ve tried pasta sauces with fresh tomatoes a few times. Unless you leave it on the stove (or in the oven) for a few hours it tends not to be so tomato-ey oddly enough. Also, it’s a hassle if you ask me (and I’m game for multi-day cooking projects). This is one of those few instances where canned is the better, or at least considerably faster, option. I have! I’ve also tried salsa with fresh tomatoes. But I must say, it’s so much more time consuming because it has to cook down on the stovetop or in the oven to develop the flavors. But it is possible! I just didn’t have access to super rich, rich tomatoes this time of year, so canned is the next best thing. I would love if you create a vegan cauliflower rice pizza crust????? Thanks for the question! I’ve added that information to the recipe. May have been asked this before. I’m in the UK and I maybe wrong but we dont have red pepper flqke in the UK. What is it and do you have an alternative? See it in a lot of recipes. Hi, living in Germany, I thought I couldn’t find them either, but when supermarkets here have an asain week they carry it. Otherwise buy some dried whole red peppers and grind them to flakes. It’s chilli flakes and you should be able to find them in most supermarkets in the UK. Hi, thanks for getting back. I did a google straight after posting (yes should of checked first :) ) and indeed its chilli flakes. I live in The UK as well and I chop up some red jalapeños as a substitute and it works quite well. Love your posts and your Instagram feeds ! Can you tell me which brand of Nutritional yeast you buy? Oh WOW! YUM! I might have to make this and just eat it plain with a spoon!